This is Chuckles, age five. TV must be bad this week, as Chuckles fell asleep reading his TV Guide. It is his favorite book. My computer magazine gives him a headache. I can tell because he holds his little head in his hands, and shakes it back and forth. Chuckles lives "free" to roam our home, with his cousin Joey, who is also five years old, and his little girl friend Bootsie, who is two years old. He is very friendly and never bites, loves to be cuddled until he wants down, and his favorite treat is "Twizzlers" ( that is soft licorice whips in case you didn't know.) He sits up, and of course comes when he's called, if he has a mind to. When he was only three months old something caused him to become paralyzed from the neck down. The Vet gave him up for lost, but not me. He spent six weeks strapped to a back board with constant undivided attention from "Mama", feeding him a special formula that I developed from the tip of my finger. After six weeks, he was again able to stand and walk, but did not recover his complete mobility for a year. He does not walk "all humped up" like other ferrets, but he can run and jump and play like all the rest, and of course is still very inquisitive, getting into things, and hiding them. His favorite play toy is a plastic bag. It makes a good place to take a quiet nap too. His friend Joey loves all kinds of squeaky toys and stuffed toys too, and Bootsie gets into everything. They are all a joy, and love to go traveling with us in our RV. 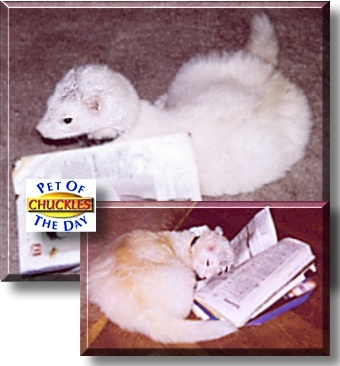 We were always Cat lovers, and have two purebred Siamese cats as well, who love to play with the ferrets. Never would have guessed that we could love little furry friends so much.